Get a constant flow of fresh teaching ideasand keep up with the latest researchwith this monthly newsletter that translates theory into strategies for action. Each issue focuses in depth on a single topic, such as assessment, cooperative learning, attention deficit disorders, inclusion, classroom management, discipline, and other timely issues. 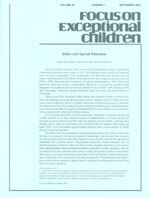 Published monthly except June, July, and August, Focus on Exceptional Children will provide you with a regular source of information, ideas, and strategies.